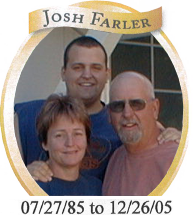 Josh was born July 27, 1985 and lived in Bakersfield California until his parents moved to Yerington Nevada. He was diagnosed with testicular cancer in July, 2004 at the age of 19. He had surgery but it had spread so rapidly through-out his body and he had to have several rounds of Chemo. He travelled from Yerington to the cancer hospital at University of California, Los Angeles for each treatment. His parents were with him the whole time and had to pay for travel, housing, and food out of their own pocket. Josh was in a catch 22 situation. He had enrolled in college and moved into the dorm but had not attended any classes as school had not started, when he was diagnosed. He went home to have the first surgery, then to Los Angeles for a second along with all of the Chemo treatments. His insurance would not pay for any of his medical bills because he was not in school! His parents eventually obtained a private, very expensive, insurance which covered some of the costs but still left them with a tremendous financial burden. This is the situation that a lot of people find themselves in when loved ones are hospitalized for treatment. It can get very expensive to live in motels and eat in restaurants for long periods of time. Most of the time family members stayed in the room with Josh, which can be exhausting. He and his family made this trip numerous times in the following year and a half. To help offset the costs, we organized the first benefit poker tournament for Josh. We were very successful and raised close to $13,000. The Josh Farler “Memorial Fight against Cancer” benefit was the “Brain Child” of Mike Nipper. Josh was very positive and patient during his illness. He loved to play poker and we would have games when he came though Bakersfield to rest at his grandmother’s home and visit with his family here for a few days before making the trip home. Then the cycle would start all over again. Josh lost his long and hard fought battle with cancer on December 26th, 2005. We will forever miss him. What started out as a group of family and close friends lead to the creation of a 501c non profit organization with a unified effort. It is our desire to grow in order to assist more people in our community. Our goal now is to help other people in Kern County with travel, food, and lodging expenses while seeking treatment. To this goal we have founded two support funds . The Comprehensive Blood & Cancer Center (CBCC) and the AIS Cancer Center both manage JFF funds for patients in need of assistance. CBCC also assist the Rio Bravo Cancer Center to assist their patients. This assistance is for anyone you think can use this help, maybe someone in your family, your church, or school. Perhaps your child has a schoolmate undergoing cancer treatments and has mentioned it to you? If so, please let us know. We do this in memory of Josh Farler whom we all loved and miss!